Infiniti FX Pros and Cons | Page 1 of 1 | Why Not This Car? What drives people to buy (or not buy) a certain car? 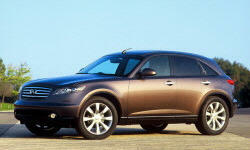 TrueDelta's members share Infiniti FX pros and cons based on their real-world driving experiences. The largest part of our decision was based on seat comfort. There are a lot of uncomfortable sets out there! Maybe the best car I have ever owned. nothing like it on the road. really stands out. Longest drive was 6 hours and had no discomfort whatsoever. Have ridden for 4 hours in a Toyota Rav4 and was almost in pain after an hour. Aggressive, edgy styling. Definitely thinking "outside" the typical SUV box. I needed more towing capability than that of the FX-35, so I traded it for the Explorer. In addition, the cargo area was too small for the dog crate that fits nicely in the Explorer.